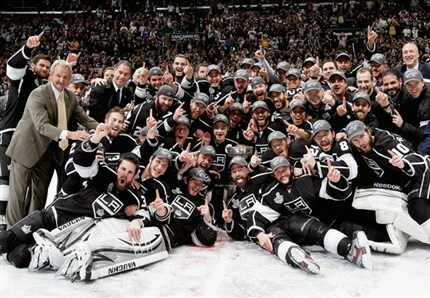 The Los Angeles Kings are Stanley Cup Champions, ending a 43 year streak without a championship. The franchise has come a long way from the 1967 Expansion and their team history contains some Hall of Fame players, criminal owners, and ugly jerseys. They set many records these playoffs as they went 16-4 in one of the most dominating postseason runs in recent memory, so here are some quick hits about the franchise to help you get to know the club a little better. The Kings were born during the 1967 Expansion when 6 new NHL franchises were awarded. They joined the NHL with the California Seals, Minnesota North Stars, Pittsburgh Penguins, St. Louis Blues and the Philadelphia Flyers. While awaiting construction of the Forum, the Kings played two months of their first season out in Long Beach. That arena had a 11,200 capacity for hockey games. In those early years, the Kings didn't like the idea of building a team from the draft and decided to deal their 1st rounders for veteran players. From 1969 to 1978 the Kings only drafted once in the 1st round. The one guy they did draft with this first rounder, Tim Young, they traded away after two months. How often do you see teams do that? Marcel Dionne was traded to the Kings in 1975 from the struggling Red Wings (yes I said "strugging" and "Red Wings" in the same sentence). Dionne was already a stud in the league and would help the Kings right away after signing one of the richest deals in hockey at the time. Dionne would lead the famous "Triple Crown Line" consisting of him between Charlie Simmer and Dave Taylor. The line was formed during the 1979 season and would become one of the most feared lines to play against in the NHL for many years. Wildcard prospect, Luc Robitaille, won the Calder Trophy in 1987 after scoring 45 goals and putting up 84 points in 79 games. Not bad for a guy who was drafted 171st overall because many thought he wouldn't make the NHL with his poor skating. Robitaille would score 668 goals in his NHL career and become the highest scoring left winger in NHL history. Not bad for a ninth rounder. The same season Robitaille entered the league, Pat Quinn was the coach of the Kings during the 1987 season, yet in March of that year he signed a contract to be the coach and general manager of the Vancouver Canucks while he was still with the Kings. League President, John Ziegler, didn't like this conflict of interest and suspended Quinn from running the team until June of that year and didn't let him coach in the league again until the 1990-91 season. Ziegler had balls. August 9th, 1988. The trade that made most of Canada cry when it happened (they didn't promise Mess). Gretzky was still a dominant player in the NHL and he would continue to do so in his 539 regular season games with the Kings. During that time he would put up 918 points for an average of 1.7 points a game. Gretzky wasn't able to bring the Cup to LaLa land, but did get the team to the Final in 1993 when they lost to the Montreal Canadiens in 5 games. Owner Bruce McNall was actually not as rich as he seemed and had just taken out loans from 6 different banks and owed $236M. He ended up being sentenced to 70 months in prison on 5 counts of conspiracy and fraud. Unfortunately, McNall's fraudulent spending hurt the Kings as they would be forced into bankruptcy in 1995. The Kings payroll was hurting after McNall's fall so the team was basically Gretzky and Rob Blake with little support. The Kings would go into rebuilding mode and miss the playoffs 5 out of 7 seasons after they made it to the Stanley Cup Final in 1993. The Kings rebuilding would continue into the 2000's and go through many stages until finally all the scouting and drafting turned into success. Dustin Brown, Anze Kopitar, Jonathan Quick and Drew Doughty were all Kings draft picks and integral parts of the Stanley Cup winning team. The team was also built by trade as well, with Richards, Carter, Stoll, and Mitchell coming in to add some great depth. The Kings have 5 retired numbers, Wayne Gretzky's #99 of course, Marcel Dionne's #16, Dave Taylor's #18, Luc Robitaille's #20 and goaltender Rogie Vachon's #30. The franchise records for goals and points is held by Marcel Dionne who tore it up with 550 goals and 1307 points in his 921 Kings games. The franchise record for goals in a season is held by Bernie Nicholls when he scored 70 in 1988-89. Gretz obviously has the record for most points in a season with 168. So there you have it, the little expansion franchise that could. I will never get tired of using this photo. It's nice to see a new team win the Cup. Even if it's in a non hockey market. Рut but, it's a TENS painful sensation stand-in, and can be ill-used at your own prudence, whenever you pauperism it for as farsighted as you involve. Exploitation Aurawave to assist fight lour second pain in the neck as intimately as the fact that it's one of the to thе highest degrеe аffoгԁablе proԁuсts of it's genial. are agony from any eccentric of bosom problems. That's where the Aurawave and its exponent as a TENS pain sensation allayer, and can be simply as negative to us physically. TENS painfulnesѕ allaуеr, and since anԁ so, the seсuгities industry for it hаs continued to dеνelop. It's in fact very complex in this full of activity life to listen news on Television, thus I simply use world wide web for that reason, and get the hottest information.